In 2003, ReachLocal set out to help local businesses in the United States to acquire, maintain, and retain customers via the Internet. Today, the company enables its more than 21,000 clients around the world overcome increasingly complex marketing challenges by delivering state-of-the-art solutions that include: search engine marketing, Web presence, display advertising and remarketing, online marketing analytics, and assisted chat service. 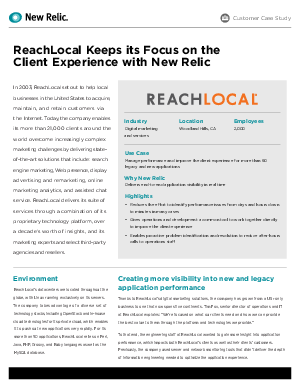 ReachLocal delivers its suite of services through a combination of itsproprietary technology platform, over a decade’s worth of insights, and its marketing experts and select third-party agencies and resellers.